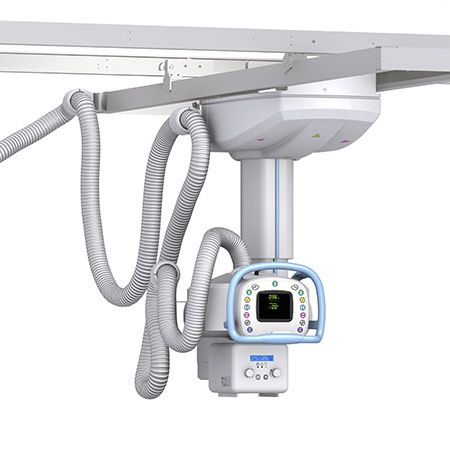 The AmRad™ Medical OTS is a heavy-duty Overhead Tube System characterized by its ease of movement and precise positioning, designed for use in any setting. Flexible in design, the AmRad™ Medical OTS has the ability to fit most room designs. Manual column movement with Vertical-Assist, Servo Auto-Tracking to table and wall stand, and fully Automated Positioning available. Optimal mechanical balancing and light weight design for ease of positioning with precision and speed for any patient procedure. 360° for column rotation and 270° for vertical tube rotation with 45°detents ensures imaging flexibility for the most difficult of patients and exams. Safety devices include negative locks on horizontal and vertical rotation in the event of a power outage. Ergonomically designed for ease of use and movement.